A compact and lightweight goggle. Tough Polycarbonate lens offers high resistance to impact fr..
Polycarbonate lens and body offers protection against medium high-speed particles at 270mph. T.. The deluxe anti-mist Atlantic™, wide angle goggle features a wide elastic headband for improved c.. Reduced ventilation. Wide, fully adjustable headband. The combination of two different ..
Gas welding safety goggles with a shade 5 lens. Indirect ventilation ports. EN166.B.3.4.. Lens Cleaning Station provide instant access for all lens cleaning needs. Strategically placed .. Ensure that you and your workforce are protected on the jobsite with our range of effective and unobtrusive safety goggles. Our goggles are ergonomically designed to ensure that they sit comfortably on all faces and do not obstruct the sight of the wearer, whilst offering full and comprehensive protection. We offer goggles for a range of different jobs, so whether you require goggles for work with chemicals, gas welding or impact jobs, we will have the perfect product for you. All of the goggles are subjected to rigorous testing to ensure that the products never compromise the safety of the wearer. All of our goggles have adjustable straps at the back, so they can be fitted for all wearers. This ensures that all parties can wear the goggles without the risk of losing them. Many of the goggles are also designed to afford spectacle-wearers the space for their prescription glasses underneath the safety goggles. All of the goggles provided by Manchester Safety Services come in specific lens shades, perfectly designed for the requisites of the job. We also offer a comprehensive lens cleaning station to ensure that your goggles are always clear and retain perfect functionality. 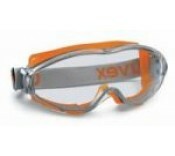 These are ideal for larger operations employing numerous workers required to wear goggles as they can be strategically placed to ensure that they are used by all parties effectively. The non-abrasive tissues will not damage the lenses of the goggles, helping them to retain efficacy.